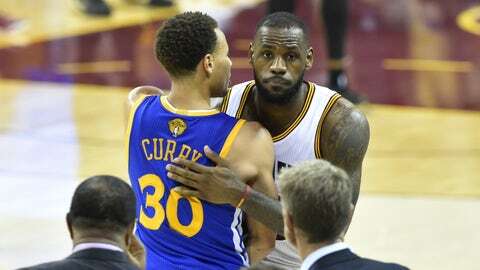 LeBron James will get another crack at Steph Curry and the Warriors on Christmas Day. The Golden State Warriors will see an old friend on opening night and LeBron James and the Cleveland Cavaliers in an NBA Finals rematch on Christmas, two of the highlight games of their title defense. The NBA released its schedule Wednesday, a more player-friendly model that addresses Commissioner Adam Silver’s directive for additional player rest by slashing the times teams have to play four times in five nights to an average of one per team. NBA senior vice president of operations Kiki VanDeWeghe called it the best schedule he had seen, adding that the league was "very, very mindful of player rest and recuperation, and the idea of putting the best product on the floor each and every night." The season begins Oct. 27 with three games, including the Warriors hosting New Orleans, the team they eliminated in the first round before the Pelicans hired Alvin Gentry, who was one of Steve Kerr’s assistants last season. Chicago hosts Cleveland earlier on opening night in its first game under Fred Hoiberg, who was hired after the Bulls fired Tom Thibodeau. Most teams begin Oct. 28, including the new-look San Antonio Spurs making their debut with LaMarcus Aldridge and David West at Oklahoma City, which could welcome Kevin Durant back to regular-season action after his 2014-15 season was cut short by injury. Later that night, the top two picks in the June draft square off when No. 1 Karl-Anthony Towns and Minnesota visit the Los Angeles Lakers, who could put No. 2 pick D’Angelo Russell into a backcourt with a returning Kobe Bryant. The Christmas slate again features five games, with the NBA Finals rematch sandwiched in the middle. Also, Miami hosts New Orleans, Chicago visits Oklahoma City, Houston welcomes San Antonio and the Lakers and Clippers continue their Staples Center rivalry. The New York Knicks, coming off a 17-65 season, are off on Christmas for the first time since 2008. The extended All-Star break the NBA introduced last season returns, with a week off around the Feb. 14 game in Toronto, and there are other tweaks that should benefit players. There are just 27 instances of teams playing four times in five nights, and no team faces more than two four-in-five night stretches. Back-to-backs were also trimmed to an all-time low of less than 18 per team. The schedule also reduces the distance teams have to travel on the second night of back-to-backs with fewer games that cross time zones on the second half, and overall the total miles traveled per team next season will be down 2 percent. "I can tell you as a player the ones that used to kill you were the either across the country or across a couple of time zones back-to-back. Those have been reduced significantly, by almost 25 percent," VanDeWeghe said. Following a season in which superstars such as Kobe Bryant, Durant and Carmelo Anthony all missed significant time with injuries, extra space was created in the schedule by having additional games on Thursdays — the lightest night of the week, when TNT hosts a doubleheader — as well as Mondays and Saturdays, when ABC will begin televising a game in January. "The key message for us in making up the schedule was be mindful of player rest and recuperation, and so that’s really a big driving force for us," VanDeWeghe said. Anthony clapped when told of the reduction of four-in-five night stretches. 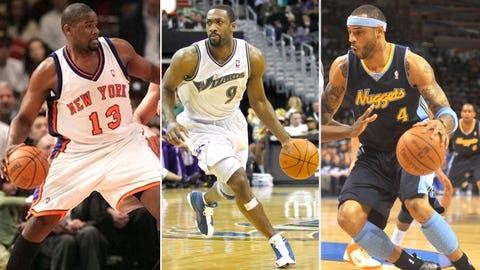 A look at some of the most regrettable free-agent signings of the last few decades in the NBA. "To not have to play all these four-in-five night games, I think it’s good for the players, I think it’s good for the league overall. I think it’s good for the fans, too," the Knicks All-Star said. A reunion night of sorts was set up on Nov. 11, when Aldridge returns to Portland for the first time since signing with the Spurs, and the Clippers visit Dallas, where DeAndre Jordan had verbally committed to play before deciding to remain in Los Angeles. 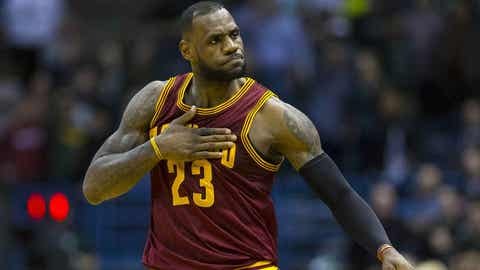 The Martin Luther King Jr. Day schedule, like Christmas always one of the league’s strongest, features the Warriors’ first trip to Cleveland since winning the NBA title in Game 6, and the Clippers hosting Houston, the team they blew a 3-1 lead against in the Western Conference semifinals. The Warriors and Cavaliers have a league-high 25 appearances on national TV.